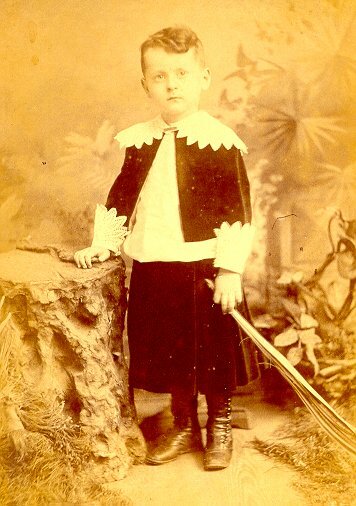 THOMAS MCNAB IRVINE, was born 2nd JULY, 1882, and spent his boyhood in Missouri except for short so-journs in Modesto, California visiting his father. After the Missouri divorce of his parents in 1893-4 he attended school until he was 14 - at which age he went to work, throughout his life never so much as thought of forgiving his father for his neglect in seeing to it that his son had a better preparation for life. His mother was forced to work - as telephone operator - and she could not, so Mac said, be expected to finance his schooling. She was too proud to plead with his father and father too self-centered to let his boys needs interfere with his plans. Late in life Mac was still "wrathy" over what he regarded as the bone of contention between his father and himself - yet somehow the same relationship developed between Mac and his own son, with the deviation that he early became severely dictatorial whereas his father simply ignored his existence. The expected came to pass - Macs son rebelled, performed by opposites, seemed bent to go out of his way to cross directives and be-little him. In his last hears Macs whole being seemed pervaded by a bitterness toward everyone, particularly his son, but daughter-in-law and grandchild too. This state of affairs made all the more tragic Macs last few months of life - for while awaiting sufficient evidence of tissue change within his body on which to draw conclusions Mac and his wife were circumstantially forced to live with the son and wife - - - though not on speaking terms. Macs work experience was largely salesmanship and hotel management, but his starting job at 14 was office boy, then apprentice electrician, then chain and rod man with an engineering crew at work on electrification of Kansas City - still later materials clerk, all for the same company - Kansas City Power & Light. On arrival in San Francisco he found his father was night editor for the Call, and it seemed his delayed arrival had served to dissipate whatever yen his father had to see him. There being no other reason for making the trip he put up at the Rex Hotel and bought a derby. His fathers "Affairs in the South Seas" had recently been published - firing in Mac a desire to see the world. He signed on as a "pantry man" with the S. S. Sonoma, sailing 1st Dec. 1904 for Sydney, Australia. Ports of call were Honolulu, Pago Pago, Samoa, Auckland - reaching Sydney on Christmas morning for a 10 day stay. Seven days of kowtowing to idle rich, won a violent argument with Harry James, who wanted to "mix his own drinks", and he was reported to the chief steward. His punishment was demotion to the glory hole - to serve 70 Jap coolies the same bully beef and state bread day after day. Said "I forked it through a hole to them like feeding wild animals. they left the crusts. Homeward bound he was denied shore leave in Honolulu but disobeyed to meet a friend of his fathers - and again ran afoul of the steward. Back in San Francisco in Jan. 1905 he found a job with the Terrace Book Shop but couldnt stomach the improper advances of the degenerate owner - and quit after fighting with him over a beating given his daughter. Loafed awhile then returned to Missouri to work for the Street Railway Co. A letter came from his Uncle Louis in St. Louis suggesting that he come there and learn the hotel business at the Monticello. This Uncle was to be held in high esteem throughout the whole of Macs life, for this was not the beginning nor was it to be the last pleasurable and profitable relationship. Treasured was a letter received in the fall of 1903 when Mac was dawdling with the idea of completing a business education. (To follow) His regret was that this Uncle and his principles were not continuously near-by to give him the encouragement and support he failed to get elsewhere. After a year of clerking at the Monticello the hotel was sold, but on the strength of his experience he managed to get on as "front clerk" at the Fairmont Hotel in San Francisco. The hotels opening coincided with the anniversary of the 1906 Earthquake and Fire. The first guests to register were Mr. and Mrs. W.K. Vanderbilt, Peter Studebaker, and Senator Robtert La Follette. In 3 months the Palace management took control and Mac took a similar job at the Niagara and Fey Hotel in Peoria, Ill. while there and offer of a clerkship at the Bienville Hotel in Mobile came from his Uncle Louis. Playing an engagement at the rival Cawthorn Hotel was Lucille Marie Biehl. One of the "Biehl Quintets", a family of unusually talented musicians who entertained with vocal and instrumental performances throughout the country at hotels and on stage. Their agents proposal to tour Europe was declined by the 3 sisters and the youngest - whose specialty was vocal or clarinet - was first in deserting the orchestra. Mac and Lucille were married in Cincinnati, Ohio 25th August, 1909, and he clerked in Kansas City at the Baltimore Hotel. Suspicions were growing that such frequent changes militated against advancement so Mac Began to look about for more absorbing employment. His next venture was as payroll and garnishment clerk for the Kansas City R.R., then undertook a first sales job with Burkowitz Enamel Co. Next he was a specialty salesman for the Loose-Wiles Biscuit Co. - introducing English style biscuits and sugar wagers. In this field he was highly successful and found he had at last arrived, soon being made branch manager with headquarters in St. Joseph, Mo. After 2 years he transferred to the Bliss syringe Co., as specialty salesman for a year, then for 10 years he was with the old Peet Co., now Colgate-Palmolive-Peet, with whom he was highly successful as the Wisconson territory representative, and became assistant sales manager of the northwest division. In 1924 he joined the sales force of the Royal Baking co., being sent to the west coast as special representative. success seemed to follow each of these moves for again he was recalled to Missouri as special representative in trying out new sales schemes out of the Kansas City central office. In 6 months he was sent to Oklahoma, then hailed to the New York Hqtrs. and made district manager of the Rocky Mountain District in Jan. 1927. Royal merged with Fleishman, and later with Standard Brands. Three Districts of 17 in the States exceeded their sales quotas, and Macs was one to the three. Yet under Fleishman influence and sales policies he was among those eliminated. Here followed a period of prolonged unemployment, with discouragement and disillusionment - with temporary relief in alcoholic excesses. Orienting himself finally he was salesman then district manager for National Paper Products Co., subsequently Crown-Zellerbach, but abandoned this field to become a seller for Blatz Brewing Co., of Milwaukee, of malt syrup and carbonated water on the west coast. Prohibition was in full force and he did wonders. Branch manager in Milwaukee in 1940. Then - with but $400 to his name and much family responsibility - he lost his job. A short term with Kinsbury Drug Co. of Manitowoc, Wisc. and he joined the Seagram sales force. First stationed in New Orleans, then Miami, Jacksonville, Shreveport. Resigned in 1943, for through the influence of his Uncle Louis he bought the Ryan Hotel lease in St. Joe, mO. Sold out in Oct. 43 because of sickness, but in 6 mos. was back in Missouri managing the Elms Hotel in Excelsior Springs for the 2 months before he could rebuy the Ryan Hotel, which he did in aug. 1944. Jan. 45 he sold the Ryan at a nice profit and splurged in California for 6 months. May 46 he bought the lease on the Crest Hotel, K.C., selling in July 48 on concluding the hotel business was due for a long spell of doldrums. Over the years Mac had found he could earn money - and he as easily learned to spend it. Having acquired the tastes of the affluent - when footloose he consumed his stake at a princely rate. On selling the Crest he purchased a deluxe Buick Coupe and commenced a tour of the perimeter of the States. Something prompted abbreviating this so after visiting Mobile and New Orleans he headed for Sherman Oaks, Calif., where his son was residing. The old order of personality conflict was still in evidence so he and Lucille spent several weeks in San Francisco and points between. Late in Jan. 49 Mac began to notice a queer shortness of breath, accompanied by an unproductive cough. Attributing this to a mild cold and being overweight he decided to watch his diet. The annoyances held on - progressed to a point of concern by mid-Feb., and the advice of and old friend - tops in his day - was sought. But the old gentleman was feebly senile, restricting his visitors to one hour a day and avoided all pretext at examination. So by all that was omitted from his perspective in as saying possibilities Mac was consigned to weeks of needless distress. A "relief examiner" suggested probably lung cancer - the old man tossed it aside as nonsense. But a hopeless condition was well along. Perhaps the old doctor reasoned correctly - that if these symptoms were from such a cause it was already too late for restitution. Perhaps true on the basis of averages - the occasionally the growth is restricted to one lbe and is removable. Surely what isnt suspected will never be looked for - and is seldom found until too late. On 11th March it fell to my let to examine Mac - his right were lobes collapsed by fluid accumulation to the level of clavicle. Blind pleurisy effusion? Perhaps tuberculosis? Malignancy? Quite a shock to me for during the winter 2 letters had come from Mac - in each a brag on his health, one week after the development of symptoms of shortness or breath. Perhaps one of the instances of subconscious refusals to admit defects. But we re-visited the old doctor, convinced him that further search would do no harm, and a bed was found in "Queen of Angels" Hospital. Nine pints of fluid were drained, immensely relieving to Mac - but the old man left no orders for examination of the fluid and it went down the drain. X-ray detected nothing. Mac was released, only to find within a few days a return of his breathing difficulties. After several days of reactionary disgust and disillusionment a chest surgeon was consulted. Repeated X-raying and bronchoscope examination revealed nothing though by April 12th two more major fluid removals were necessary. This day he entered of rib resection and digital examination of lung and pleura. Discharged May 4th. May 6th was told he had cancer of lung-inoperable. Transferred to Van Nuys Hospital for deep X-ray therapy - to no avail. Mac lost such weight and become progressively weaker - confiding to me 18th June that he "hoped the end wasnt far off, and that it might come mercifully during sleep". His wishes were granted - death occurring 26th June, 1946. Interred in North Hollywood Cemetery, Los Angeles, Calif. Shortly after Macs demise Lucille found it expedient, even necessary to absent herself from her son and his wife. She was fortunate in locating an old friend of her entertainment days, also widowed and living in Los Angeles. Never robust, Lucille of late years had been disturbed by thyroid and high blood pressure troubles. It was gratifying to learn of this so satisfactory arrangement of living with a friend of common interest and mutual sympathy, but it was not to last but a few months - the exact date unknown. Monticello Hotel 304 Carlton Bldg. I want to offer a word of encouragement in your effort to put a better foundation under your life by a little more education from school. It is not a lecture I want to give, nor do you need "warm air" so much as a stiff upper lip. Had I the hope of seeing my boys as promising as your abilities are, ti would go far to further swell my pride in them. In whatever you do though, my dear boy, guard your health. Remember that ill health is the awefullest handicap, except vice, to a successful career, to happiness in any walk of life. Moral health is as necessary as physical. If you have the good fortune of making friends easily as did your father, teat your friendships by their moral worth and when you make friends of good and true men, no matter whether poor or rich, or of what creed or none, make them part of you life. Your soul will grow and expand by giving its strength to such friends. When you find by chance a friend diseased in principle, one in whose friendship you find no better moods and better aspirations prompting you, cut it off to casual acquaintance. Exchange no salt with such Arabs, for their life is poison to you. I never have indulged such a friendship without finding myself lower by it, weaker, less happy and in danger perilously. But I have almost lectured after all. The text of friendship is a favorite one with me however, for of all men I knew you father suffered as much from mistaken friendships in their effect upon him inwardly as any one well could. I trust, Mac, that you will always be proud to guard you mothers happiness. No one can ever take her place. It would be a great credit to you to succeed and become a prosperous man. But it would be a hundred times better to just get along and have been a true son to her, than to leave her out of your life and be rich. It may be possible for me to suggest some way your mother can have a rest and you both can take in the Fair next year. It would be worth a years schooling to you to have the opportunity of seeing and studying the entire world while you are so young. I am thinking it over and watching out for a way to help you out. Let me hear from you and dont take me for a preacher. I only wish I could see you with the start Leigh had in education. Yet it is quite possible to have it so.